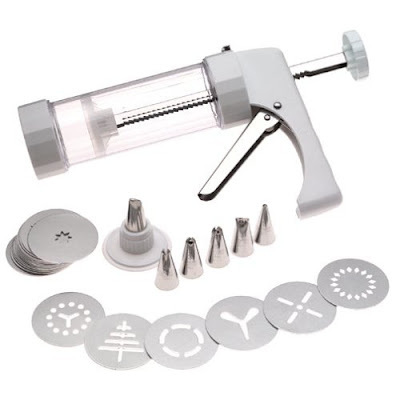 I took this moment of retro-cooking inspiration to break out one of my new wedding gifts: a Cookie Press and Decorating Kit. The kit even came with a recipe. It was all seemingly so simple. Mix a TON of butter with a bit of sugar, an egg and some flour. 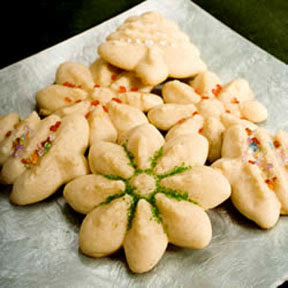 Throw in a few spices and voilà - beautiful and delicious spritz cookies full of buttery deliciousness. Please note: these are NOT my cookies, they are the creation of High Altitude Gardening. Incidentally, this cookie recipe requires no adjustments even when baking at high altitude. They are THAT straightforward to make. Two batches of flattened, and oddly-mishappen cookies later, I finally had enough half-way decent cookies to pack up as gifts. There's no better way to make new friends than to bribe them with butter and sugar! p.s. Despite looking a little funny, the orange blossom cookies were DELISH!!! Images lifted from amazon.com and highaltitudegardening.blogspot.com.